Several players from clubs in the capital featured for England as they warmed up for the World Cup with a 2-0 win against Costa Rica at Leeds United’s Elland Road. Here’s how we rated the London contingent on an encouraging night for the Three Lions. A day after opening up on his depression, the Tottenham enjoyed a night of free roaming on the left flank. Looks in good condition and is pushing Ashley Young hard for the shirt in Russia. To the manor born in the first half, driving up the pitch when he found space and showing a neat range of touches in the final third. Influence waned as the game ticked by but the Chelsea youngster looks ready for the big stage. 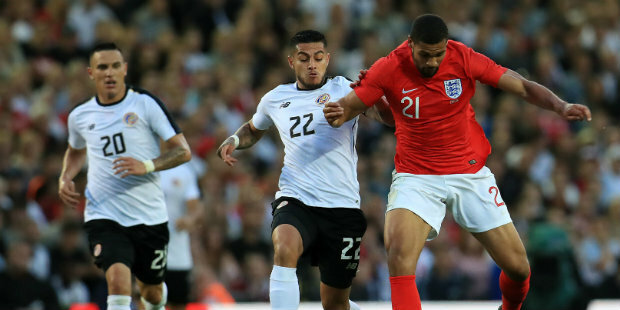 Faces an uphill battle as the only outfield player not to start either of the last two games but grabbed his 16th international goal – the most in the squad – with a sharp diving header after coming on as a substitute, making it a good night’s work for the Arsenal forward. Also on as a sub, the Tottenham playmaker bagged an assist by finding Welbeck with a cleverly-executed cross. England want more of that kind of productivity from him. The Spurs man zipped around on the right after coming on and was quick to show off his impressive crossing skills. Given the captain’s armband and a chance in the centre of the back three after coming off the bench. The Chelsea defender stood his ground as Costa Rica belatedly asked some questions in the last 10 minutes. Be the first to comment on "England ratings: How the London contingent fared against Costa Rica"